There was an interesting news item this week. At the Ad Hoc Liaison Committee to address the humanitarian situation in the Gaza Strip, Israel presented a $1 billion plan to address Gaza’s crumbling infrastructure. The plan was presented by Israel, not by the Palestinian Authority, who is supposed to rule the Palestinians. It was not presented by anyone representing Hamas, the terrorist organization that effectively rules Gaza. That Israel felt the need to present such a plan, in the absence of anyone doing so on behalf of the Palestinian government, suggests that the two-state solution is currently untenable. Even if Israel were to negotiate a peace agreement with the Palestinian Authority, the PA would have no means to carry out its obligations, for it has failed to build the necessary institutions for statehood. Of course, no negotiations are going on between Israel and the Palestinians. PA President Mahmoud Abbas, angered over the President Donald Trump’s recognition of Jerusalem as Israel’s capital, last month denounced the United States and said that he would not participate in any American-led peace efforts. But just because no talks are going on, it doesn’t mean that the two sides aren’t working together. If his words and actions in the year since he was appointed Assistant to the President and Special Representative for International Negotiations by President Donald Trump are any indication, Jason Greenblatt seems intent on fostering cooperation between the two sides, especially in areas that can improve the lives of Palestinians. This past week saw the installation of a cargo scanner at the Allenby Bridge crossing into Jordan. It is expected to double the number of containers that cross the border between Israel and Jordan to 200 each day. In July, Greenblatt was on hand as Israel and the Palestinian Authority signed an agreement that would involve Israel selling the PA 33 million cubic meters of water a year. This agreement is an example of the parties working together to make a mutually beneficial deal. In fact this is the second important agreement reached between the Israelis and Palestinians this week, the first being the agreement to energize the Jenin electrical substation, which was signed on Monday. That agreement came about with the strong support of the Trump administration and other international partners and provides another example of cooperation between Israelis and Palestinians that will lead to economic improvements in the lives of Palestinians, who now, in the span of one week, benefited from agreements that provide key improvements in the critical areas of water and electricity. While Israel and the PA don’t appear any closer to a peace agreement than when Trump took office, Greenblatt is trying to assure that they work together more. Clearly, Greenblatt appears willing to discard the old theology of peace talks. 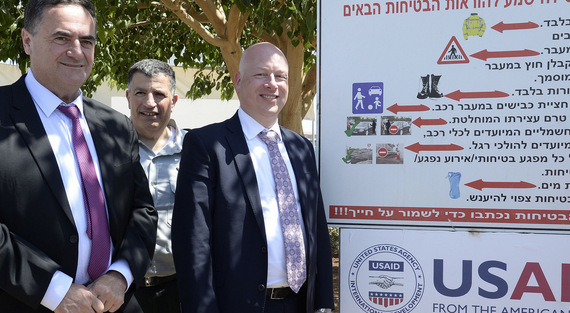 Instead of focusing on political talks, which, in the past, have been marked by distrust and blame, Greenblatt appears more interested in showing Palestinians that there are benefits to cooperating with Israel under the auspices of the United States. He and the Trump administration appear to be emphasizing the promotion of coexistence over political talks. The question is whether this new approach will succeed where the focus on the political has failed.